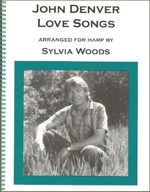 Sylvia Woods has arranged 12 of John Denver's beautiful love songs for advanced beginner and intermediate harp players. His music sounds wonderful on the harp, and is fun to play. There is only one sharping lever change in the entire book. Even if you don't think you're a John Denver fan, we're sure you'll love these lyrical arrangements. Songs are in the key of C or 1 or 2 sharps. Lyrics and chord symbols are included. 48 pages, spiral-bound.